We had our annual Summer Party in the garden yesterday. An al fresco lunch for as many friends as want to come, followed by an afternoon and evening of frolicking, croquet, kubb (an old Viking game that has become popular again as a garden game over the past 5-10 years after a thousand years of obscurity) and far too much alcohol. It’s always lovely, but there IS a certain joy to saying goodbye to the last guests on Sunday around noon once the dishes have been done and the garden restored to some sort of normalcy (i.e. the bottles and cans have been picked up, the games have been packed away and the furniture is no longer clumped in the middle of the lawn around the fire pit. Now it’s just me and the birds in the garden again; I even sent the Flâneur Husband back to the city to nurse his hangover with pizza, sofa and telly while I nurse mine with left-overs from yesterday and a few perennials that need planting and moving. 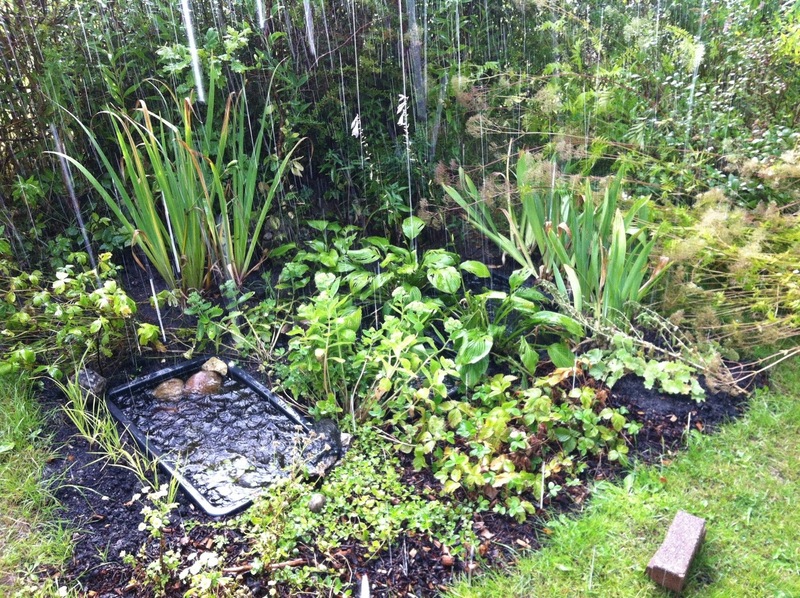 Note how only one Puddle is actually visible this year… (The other two to the right of the stormy one are mainly hidden by the planting, however tumble-down the plants might be.) To the left of the “visible” left Puddle I have planted some iris germanica that I grew from seed two years ago and left in tiny pots for years; they should be happy enough here, and they should soon shield the last puddle from view. After all, The Puddles are only intended to be seen in glimpses, so that’s why I’ve surrounded them with fairly tall perennials with somewhat over-hanging habits – from right to left it’s iris siberica, hosta (unknovn variety from my childhood garden but with plain green foliage and mauve flowers), sedum (another unknown variety from my childhood garden) and finally the iris germanica. To allow for glimpses of the water, though, I’ve planted low ground covers at the front; from right to left it’s alchemilla mollis (Lady’s Mantle), wild strawberries and some unknown groundcovering plant that I weeded from the Courtyard; it has pretty enough foliage and when established it will have yellow flowers throughout summer. To hold the – preliminary – corner of the area by The Puddles I’ve transplanted a white-flowering plant that grows like a weed here – though it’s certainly a garden plant of sorts. -Okay, so that plant just went out during a break in my writing; instead this corner is now the site of the newly purchased day lily hemerocallis Frans Hals. It does mean I’ll have an awful lot of spiky leaves around The Puddles (three different types of iris AND the day lilies), but the rest of the planting should soften that impression, and either way day lilies will add some blooms at a season when the rest of the flowers are either budding (the sedums and asters) or spent (the irises, astrantia and lady’s mantle). I’ve also made a change to The Sunny Border since this photo was taken. The Japanese anemones seem to dislike the conditions here – though I’ve seen them do well in full sun in the gardens of the Royal Library in Copenhagen – so I moved some of them from the far end of this border to make room for some other newly purchased day lilies hemerocallis Double Firecracker. The Flâneur Husband has complained about his birthday present, the three roses my parents gave him. I picked out the variety and ordered them, knowing he loves red roses, but the L.D.Braithwaite roses very quickly turns decidedly hot pink rather than red once they are blooming. I guess that’s what red roses do when they get full sun; my other red rose – torn from the ground with my bare hands as I rescued plants from the destruction – is turning that same colour even though it used to bloom truly dark red in its old location is half-shade. Have I mentioned I love my garden? Garden Plants to the Rescue! 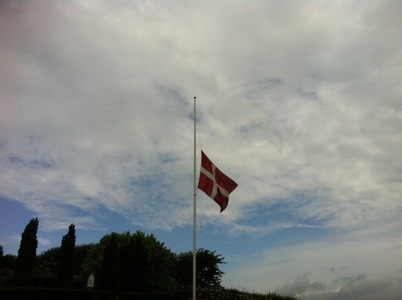 Last week I had to travel to Jutland to spend the last week with my Dad. He died on Thursday, the Summer Solstice, having gone to sleep and then 10 minutes later it was all over. We buried him on Saturday. It was a good ending, really; my two brothers and I all managed to spend lots of time with him during the last week, and it was really nice to be able to be there for him – and with him – in his last time. Anyway, The Flâneur Husband and I came back to Copenhagen on Sunday around noon, and then in the afternoon I went up to the garden to have some time to myself. I didn’t go to work yesterday or today, and instead I’ve mainly just been sitting around in the garden doing absolutely nothing. It’s far from finished, but it’s beginning to take shape. Astrantia, sedums, hostas, purple iris germanica, purple asters and a single perennial sweet pea to climb the half-dead small beech tree just in front of the hedge. I have been looking around the garden to see what else I have that could find a home here, and there are some more irises (both the native yellow version and the blue iris siberica that I grew from seed – before I then got two large clumps of it from my Mum…) and of course I need to add some creeping ground covers to cover up the edges of the tubs. 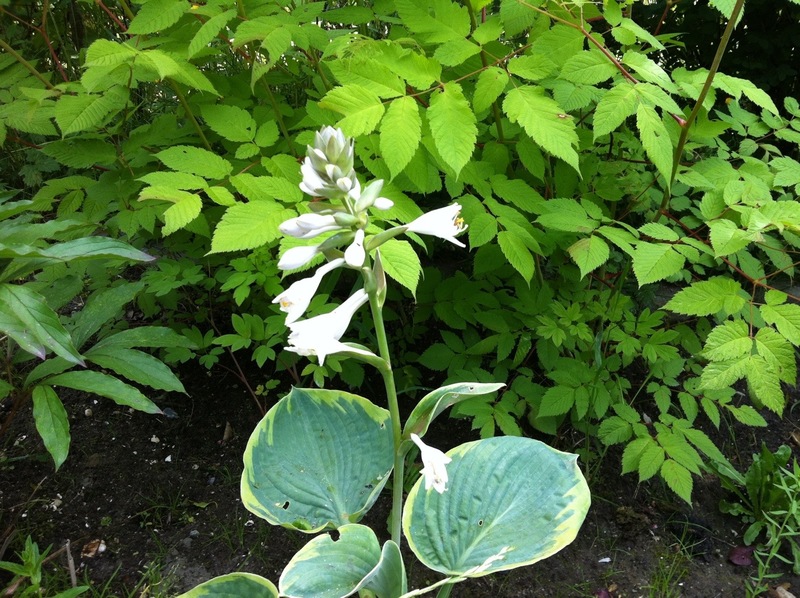 I have an unidentified creeping ground cover with variegated leaves that might look nice around the edges, and it should get enough shade from the larger plants for the white markings to “pop”. I’m considering moving the variegated hosta over to The Puddles as well; it’s currently in The Ambitious Border surrounded by much showier plants, so it might get more attention if I moved it to a place where the foliage would be more noticeable. Below you can see the small hosta squeezed in between the peonies, the goatsbeard and the day lilies. It’s lovely, but it becomes rather lost in that company. The goatsbeard is in full bloom these days and looks amazing. 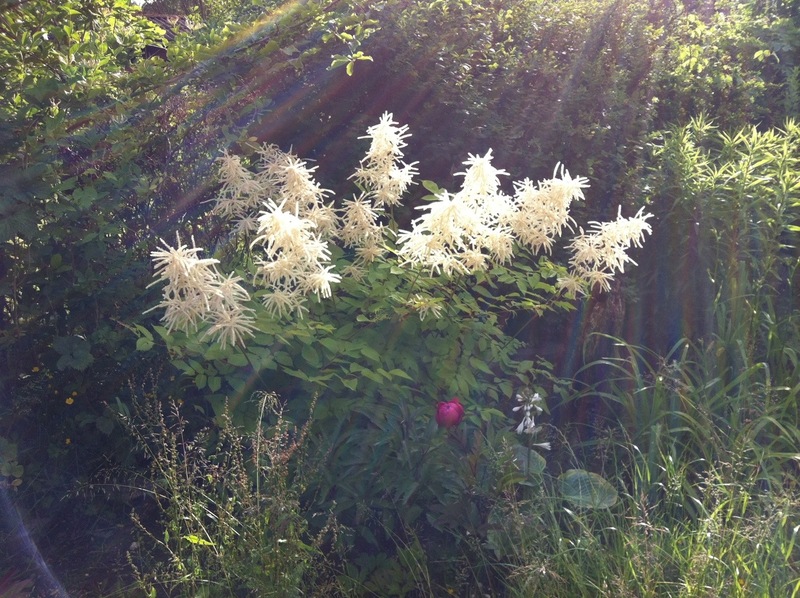 It comes from The Flâneur Husband’s grandmother’s garden and was given to me as an astilbe, but I’m so happy it’s goatsbeard instead; so much showier than the smaller astilbe plants, and perfect for covering up a somewhat bedraggled section of the hedge. In front of the goatsbeard is the only peony bloom of this year. I’m a little disappointed, as I would have liked to have more flowers, but since I only planted the peonies last year I guess I have to accept that they don’t put on too much of a show this year. Maybe next year, eh? Still, the single bloom is pretty, so I mustn’t complain. 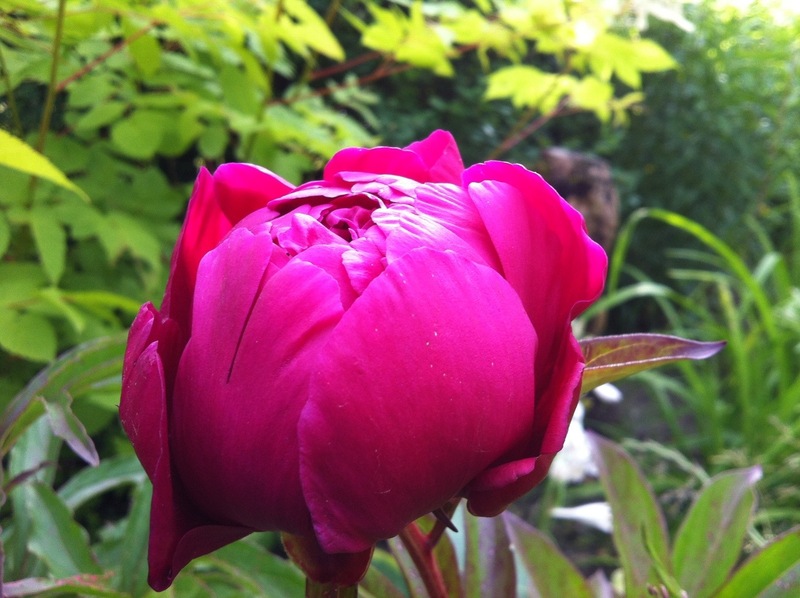 And maybe next year the 5 other peonies will bloom as well. 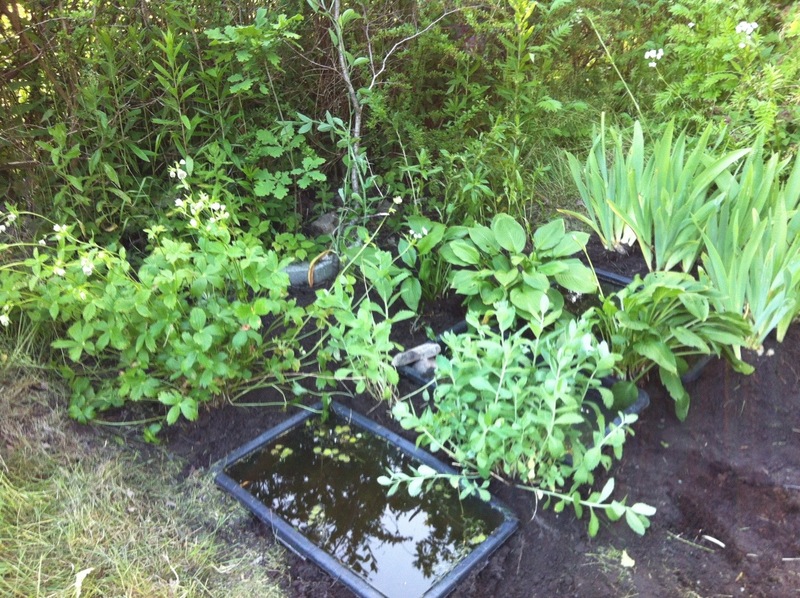 So I spent the weekend digging – again… Seems like it’s becoming one of my regular activities in the garden, carving away at the lawn inch by inch to make room for more plants. This weekend I was hoping to complete The Puddles – the new name for the miniature pond – and surroundings, but a sore back and too much sun – I got slightly red on Friday, so on Saturday and Sunday I tried to stay out of the sun as much as possible, digging in short intervals with long breaks in the shade, and of course covered in SPF 30. Anyway, I didn’t finish it this weekend, but I did manage to clear a 3 x 4 meter stretch of lawn and dig out most of the puddle holes. It will just be a couple of 90-litre plastic tubs, so not the biggest holes in the world, but with heavy soil on top and pure clay further down it’s plenty big for one person to dig on his own and maintain momentum. I’ve sited them at the end of the Ambitious Border (or what will BE the end of it; right now there’s still a stretch of grass between the part that’s been completed and planted and the site of The Puddles, but over the summer it will be joined together, I promise.) so they will be visible from the covered terrace and from the hammock. There’s an white astrantia major from the Flâneur Husband’s grandparents’ allotment sitting in the lawn in front of the large rhododendrons, and you sort of have to know it’s an inherited and treasured plant in order to notice it at all, so it will be relocated to the pond area to become more prominent. It’s one of those perennials that will stand up for almost anything, so apart from the nostalgic origins of the plant it’s also a favourite because it is so low-maintenance. And of course it doesn’t get much more low-maintenance than hostas. These are from my mother’s garden and have overwintered in a bucket in the courtyard (now that’s hardy!). This clump will be divided into three or four smaller sections so they can cover a larger area, and of course they’ll spread out and just do their thing. I think the lushness of the hosta leaves will fit in nicely with a spot of water, and they will also provide a nice cover for small wildlife – hopefully not just slugs! The site of the sand box that was removed from the garden when we bought it has functioned as a “holding pen” ever since, and I must say it’s rather over-crowded – and also somewhat unmotivated, sitting in the middle of the lawn and looking a bit out-of place. It holds a clump of very pretty purple asters from my mother’s garden that can go at the back of the Puddles up against the hedge to the neighbour. The “holding pen” also contains two types of iris. A large purple bearded iris (or rather lots of separate rhizomes) that was salvaged from the re-vamping of the area around my old block of apartments, and some slightly smaller iris that I haven’t seen in bloom yet as they were transplanted from the Flâneur Husband’s grandparents’ allotment last summer. I also have some tiny iris sibirica that I have grown from seeds in small pots, and they really need to move out into the garden and get some more space very soon, having lived in 4″ pots since they were sown last spring. I’ll dot the irises around The Puddles in clusters, and I think it’s possibly a safe bet to say that iris and water will look great together. This is a plant that grows in a very clearly defined area of the lawn, leading me to suspect it might be the remnants of a flower bed that had been left to become infested with grass over many years. (Like so many other beds in the garden.) I love the foliage – which grows 1½ foot high – and later in summer it will have umbels of small white flowers up to 2-3 foot high. Obviously I won’t mow the area where these are clustered, but I’ve also lifted some and stored in a bucket in the courtyard to be planted around The Puddles; I have no idea what this plant is, but it’s hardy and pretty, and that warrants a space in my garden any day! The picture above are the perennial sweet peas at the back of The Sunny Border, but we also have them growing in various places at the edges of the lawn, so I will move at least one plant to the back of The Puddles. Just in front of the hedge is a small beech tree that is bare up to the top of the hedge (but has healthy foliage above that, perhaps because it gets more sun up there), and it will provide a good enough natural climbing post for the sweet peas to add some height and flowers to the area. So there… I think I will be able to fill out the area nicely from the beginning, and if I do end up with a blank spot or two I have several other contenders that can be brought in, though I think the above is really about as many different types of plants as I need to make the area diverse and interesting, but not messy and confused-looking. 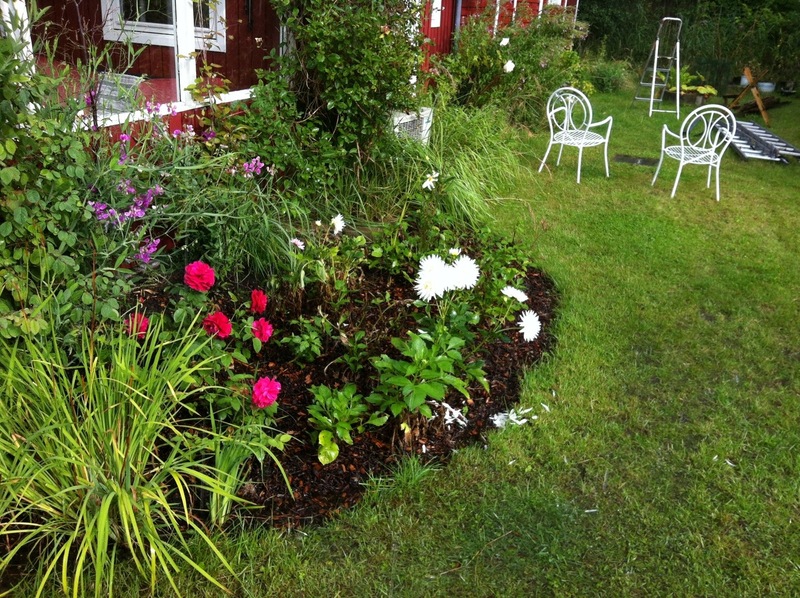 I’m going up to the garden again next weekend for a quick visit (before travelling on to Jutland to visit my parents) and I hope that will allow me to get The Puddles in place, and maybe at least some of the planting.